I’m a fan of a thick eye lined upper lid that will make FKA Twigs swoon. I picked up Rimmel London’s Scandaleyes Jumbo Liquid Eyeliner in Black to update my Spring make up look with that goal in mind. Not only is the Scandaleyes Jumbo Liquid Eyeliner easy to handle. It feels like a marker in your hands. You can be creative with your lines and yet still hold a classic look for your day to evening face. 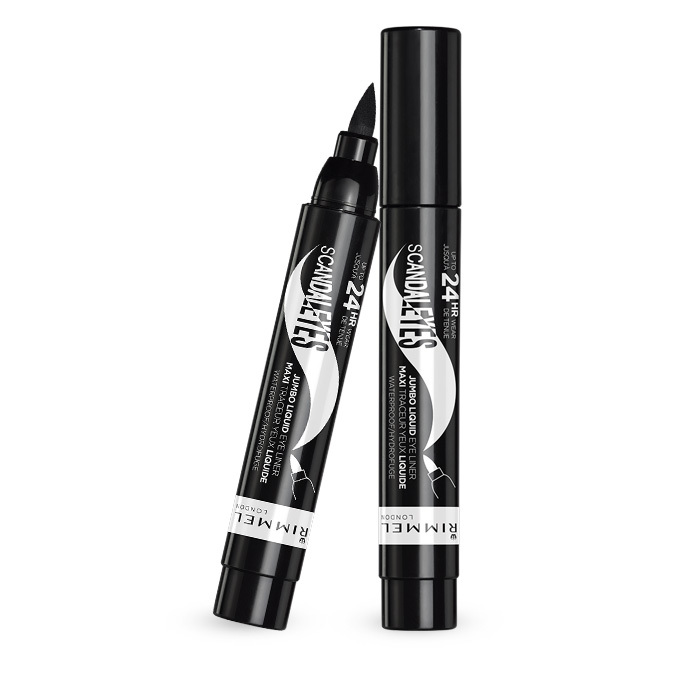 It’s easy to pop the Scandaleyes Jumbo Liquid Eyeliner into your make up bag for the day. Even if you are not looking for an intense bold line, the Scandaleyes Jumbo Liquid Eyeliner will can you give you a minimal bottom eye lid look that is just as chic without too much hootspa. This entry was posted in cosmetics, eyeliner, make up, make-up, rimmel london, scandalyes jumbo liquid eyeliner (black) on March 29, 2015 by thirtyfourflavours.